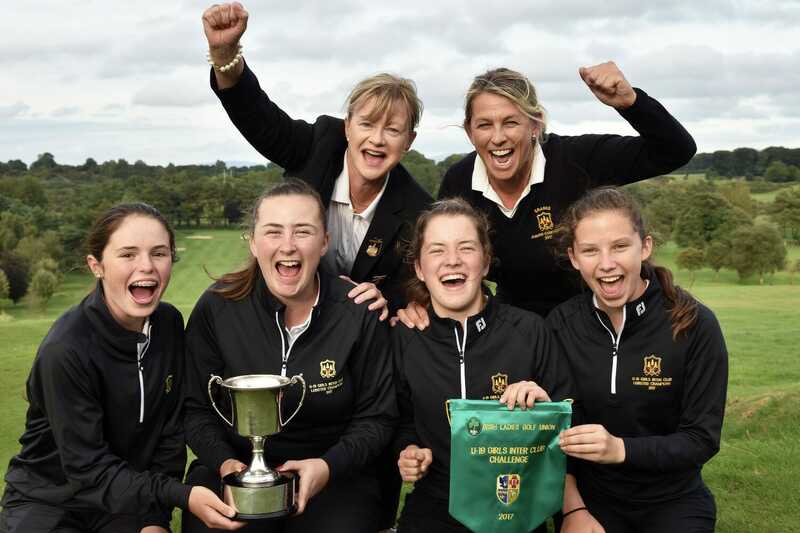 After a thrilling Senior Cup Final yesterday, the spotlight was now on the Girls Inter-Club in which The Grange, Royal County Down Ladies, Limerick & Co. Sligo were all aiming to be crowned 2017 All-Ireland Champions at the Royal Curragh Golf Club. First up were the Grange and Royal County Down Ladies which proved to be a ding dong battle with both teams one point a piece after the first two matches. Lavinia Bowe secured the first point for Royal County Down Ladies with a 2up win over Ellen Nolan from Grange but the scores were equalled shortly after as Rachel Lynch from Grange beat Katie Poots 5&3. The last match between Ciara Corcoran and Julia Hill seemed to be heading the way of the Grange as Ciara was 4up through 12. However, Julia staged a comeback and brought the match all the way to 18 but lost 1up in the end. Limerick were too strong for Co. Sligo in the second semi-final in which Emily Walsh and Emma Guinane won 6&4 and 5&4 respectively to secure their place in this afternoons final. An early lead for Emily after the first 6 holes was too much for Katie Dunne of Co. Sligo to claw back. The second match was all square through six holes but Emma Guinane won 4 holes out of the next 6, which again was just too much for Zoe Dunne to win back. Royal County Down Ladies were now up against Co. Sligo in the 3rd & 4th play-off and made two changes to their morning team. Aine Curran and Kerri Grant took the places of Lavinia Bowe and Katie Poots, both of whom had already played in the Senior Cup on Friday. In a very exciting match, Julia Hill and Aine Curran both won on the 18th to give their team victory.